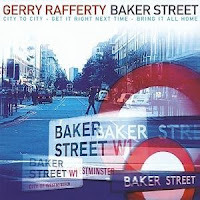 Gerry Rafferty is one of those artists with a fair body of work, but people only really recognize one or two of his songs (for example he was part of the band Stealers Wheel, which had the hit "Stuck In The Middle"). Further, even when they do know a song, they rarely know who it is, or even the name, they just like it. This song is one you probably know, even though you aren't aware of the name or the artist. It gets regular play now but was forgotten for a time, and its called "Baker Street." "Baker Street" is one of those timeless songs, although it has bits from the late 70s/early 80s era that were often used in commercial pop. The music is pretty standard stuff until it gets to that sax solo and suddenly you're pulled into another place entirely, which I why I think people don't remember it well beyond that part. Its like listening to the William Tell Overture and not remembering what it is until you get to the Lone Ranger theme. That solo was supposed to be done on guitar, which would have made it much more ordinary and forgettable, but the studio guitarist didn't show up. So sax player Raphael Ravenscroft stepped in and they tried out a horn version. He hit it in one take and they all were blown away, like everyone who listens to the song. History was made, and its one of the most iconic, well-liked riffs in music history. Would the song have been as good with the guitar? Possibly, there's a guitar solo near the end and its pretty good too, but the sax really sets it apart. His song "Baker Street" was about how uncomfortable he felt in the star system, and what do you know, it was a giant world hit. The album City to City went to no. 1 in America, and suddenly he found that as a result of his protest, he was a bigger star than ever. And he now had more of what he didn’t like. And although he had a few more hit singles in the United States, by 1980 it was basically all over, and when I say ‘it’, I mean basically his career, because he just was not comfortable with this. The music industry... is something I loathe and detest. It conjures up images of a gigantic factory spewing out parts of the machine. In many respects, this of course is exactly what it is now. Rafferty liked to make music but he didn't like being a star, it just felt empty and pointless to him. The touring, the interviews, all of it just was cold and pointless and he walked away from it. To me the song evokes that early part of dawn before the sun is up, walking down an empty street in the cold. In a way this song is an indictment of so many lives, the dreams that things will be better tomorrow but not changing anything to make it so. The cold city that cares nothing (Rafferty was referring to London, but it could be almost any city), the day wasted with yet another party so you can sleep at night, the guys you know who have dreams but never will attain them. It is a bit of a bleak song, but it isn't played as a dirge, just as a thoughtful piece with that amazing, soaring saxophone solo that gives you hope that maybe things don't always have to be that way. Did they play the sax part of this on 'Hill Street Blues'? I totally think that they did. I don't remember that, but I did find out that Gerry used to be in Stealers Wheel (stuck in the middle guys). That is a great album. He had real talent.